Like any cyclical market, the Ford Mustang sales trend follows suit with the adage “what goes up must come down” … and so on we go. July’s final sales have been finalized, letting the June (2011 peak thus far) excitement down a bit amidst a continually downtrodden economy. Add in a dash of triple-digit weather across most of the nation for nearly 40 days (and counting) and it’s not too hard to wonder why no one wants the 6-hour chess & tennis match of a dealership experience…new Ford Mustang or not. Keep reading for a news brief from Ford on the latest Ford Mustang sales figures. Sales of the Ford Mustang for July of 2011 were 6,805 compared to 7,489 from July of 2010 showing a 9.1% decrease in sales from the previous year. 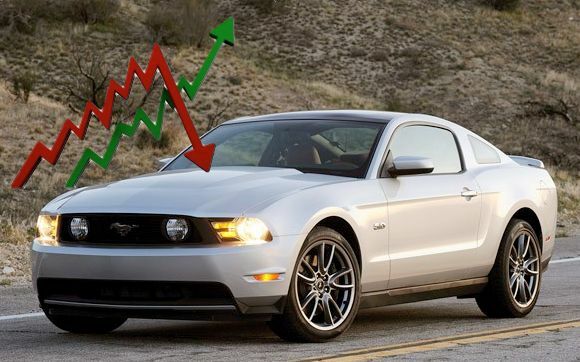 Year to date Mustang sales are 45,846 compared to 47,524 for 2010, which is a 3.5% decrease over the previous year. Month to Month sales hit the skids as June 2011 sales were 8,805 compared to July 2011 sales of 6,805 which is a 23% decrease. Taking a look at the competition the Chevrolet Camaro sold 7,671 and the Dodge Challenger sold 3,509 units for July. I bought a 2012 Mustang GT CS in March and got exactly what I wanted and only had to wait three weeks for my order to be completed. Great service, great car, and now I am ready to install the Procharger Supercharger and start running the bejesus out of it.